Mariners Latest: 16 And Counting??? Just A Reminder of What Winning Was Like! Well, they've done it again. 16 straight losses. Gone are the days of one run losses and .500 baseball. Since our last appearance at the .500 mark we were just 3.5 games out of first place and looking at playing some good baseball in July. Since that last win against Oakland we have lost 16 in a row and have been absolutely pounded on many occasions. Today was no different. The Yankees got things started right away on a 2 run homerun by Mark Texiera and after we scored a run on an Ichiro sac fly the Yanks came right back with a run of their own and another 5 in the 4th. Vargas pitched 4 innings today which was one better than his last three inning outing. The M's starters as a whole have been knocked around lately, including Cy Young winner Felix Hernandez. 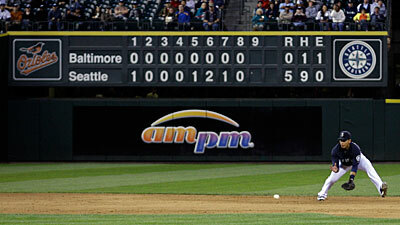 The final score ended up being 10 - 3 as the Mariners got on the board with 8 hits. The good thing I saw today was a multi-hit game by Justin Smoak. He has been in a major slump as of late and actually hit in a run today too. Here's to him snapping out of it and starting to produce again. Ichiro, Ryan and Ackley all got on the board with hits again and still seem to be the fighting force in this offense. Ichiro however has looked absolutely terrible in the field, as though he isn't even trying anymore. I don't know what the deal is, but it seems he is a bit apathetic. Hopefully he fixes this attitude before he is just simply pathetic. So, it's not the end of the world. Now we are just being the team that we thought we were going to be. We should really stop wasting time though, there is a lot of talent left to see. If Jack Z has seen all the talent that he wants to see already, we are in for another brutal season next year or a very exciting trade deadline and off-season. We have got to make moves, there's no question about it.